253 days . . .
. . . until the New Hampshire primary. Actually, not. I got behind after last weekend. In light of your comments regarding Cuba and Castro, do you think the "box upon box of cigars -- Montecristos from Havana" that you have in your office have contributed to CastroÕs reported wealth? The winner of our health care debate could even light a Victory cigar with one of your Montecristos (though we may want to consider shipping them to the safe house where I have put a master copy of SiCKO in the event that the Bush Administration tries to seize the film). I'd pony up for pay-per-view to see that. 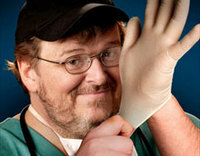 I give Michael Moore a lot of credit. Who else in a single act could 1) point out the absurdity of our embargo of Cuba; 2) point out the inefficiencies and inequalities in the American health care system; and 3) point out that the Bush administration's let-em-rot policy toward wounded war veterans has its roots in its treatment of 9/11 rescue workers? Now that the Bushies' oil buddies have tumbled to the stupidity of our economic isloation of Cuba, it's fair to ask: is there anybody, other than some troglodytic right-wing Cuban exiles, who thinks that our policies toward that country make any sense at all? Sometime later this year, less than 70 miles from Florida, a consortium of Spanish, Indian and Norwegian companies will likely start drilling for oil. It could mark the beginning of a Cuban oil rush - one that American oil companies won't be able to join, despite their proximity to the action. And that has some U.S. oil industry executives and lobbyists seething, especially since the American Association of Petroleum Geologists calls the offshore Cuban oil deposits a "significant find." U.S. oil companies can't play in these waters, of course, barred as they are by sanctions prohibiting them from doing business with Cuba. Ironic, isn't it: it may take the prospect of a capitalist energy bonanza to make our leaders realize that maybe dealing with socialists isn't so bad. The US embargo continued to have a negative effect on the enjoyment of the full range of human rights in Cuba. Even Cuban dissidents agree that the U.S. policy is dumb. With the end of the Castro era fast approaching, the U.S. needs to act thoughtfully so that the successors to the crooks and con men of the Batista days will not return to power, and so that Cuba's admirable advances in education and health care will be preserved. Given Republican pandering to and financing by hard-right Cuban exiles, I don't think that such thoughtfulness is likely from this administration. With Iranian President Mahmoud Ahmadinejad visiting Venezuela today, it might be a good time to consider another "change in course" for U.S. policy. The isolation of Cuba, a legacy of the Cold War, is pushing that country closer to America's most dangerous enemies. In a recent open letter to President Bush, several major Cuban dissident groups called for an end to U.S. restrictions on travel and remittances to Cuba. Now joining their call is the Miami-based Cuban Consensus, a coalition of 20 pro-democracy groups including the "hard-line" Cuban-American National Foundation. Loyola, a regular contributor to the National Review, points out what has been obvious for a long time: the U.S. sanctions on Cuba are counterproductive. How is it that the strategy of trade and engagement that helped bring about the end of the Soviet empire and transform China is held to be inapplicable to Cuba? The answer lies in domestic politics, and specifically the politics of Florida. Politicians competing for the support of the Cuban emigre community there keep trying to outdo each other in ratcheting up the anti-Cuban rhetoric. This has been a factor primarily in Republican politics there, so it is significant that both the emigre organizations and their GOP supporters are starting to face reality. Loyola is right that it makes sense for the U.S. to engage Castro's regime, not to isolate it. He gets to that conclusion for some suspect reasons--chiefly, an inordinate fear of Venezuela's Hugh Chavez--but the fact that someone with his right wing cred is on board the sanity train is good news indeed.